DORSET doom heavyweights ELECTRIC WIZARD have promised a “mind-destroying” exclusive headline performance at Damnation Festival. The band, who recently sold out London’s cavernous Forum, will bring their full lights and visuals show to Leeds University Union on Saturday, November 3, 2012, for what will be a full on assault of the senses. Also joining the bill are Norwegian blackened thrash outfit AURA NOIR, Irish thrashers GAMA BOMB and elegant doom trio 40 WATT SUN, who will play their only UK show of 2012 on Damnation Festival‘s newly sponsored Eyesore Stage. ELECTRIC WIZARD‘s Jus Oborn believes fans who couldn’t get their hands on tickets to the London performance, will experience something special at Damnation. He added: “The sellout show at the Forum was a massive success and the fans loved the psychedelic lightshow. “We had been working on the film show for years and when the opportunity arose to work with the lighting people from the Hawkwind lightshow we knew it would be the ultimate mindfuck. And if the prospect of ELECTRIC WIZARD at Damnation Festival wasn’t enough to celebrate, Irish thrash kings GAMA BOMB will be hosting a one-off 10th anniversary party on the Jagermeister Stage. The band said: “Given that we started our band with the ambition of playing songs that sounded like Nuclear Assault and the aim of some day playing a show outside of our home town, it’s pretty amazing that we’ve lasted for 10 thoroughly wasted years. “Though we’re insanely busy doing behind-the-scenesy stuff right now, we’ve managed to find time to book one special 10th anniversary show this winter at Damnation Festival. “By the time we put on some trousers and take to the stage there, we’ll have a killer fourth album to show off, as well as wheeling out all kinds of old songs we’ve forgotten how to play. “The UK has been very good to us over the last 10 years, so this is our way of saying ‘Cheers for that, can you pay in to one more show please?’. 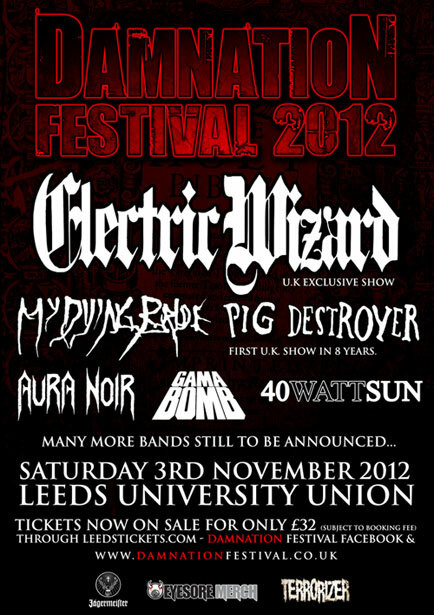 ELECTRIC WIZARD, AURA NOIR, GAMA BOMB and 40 WATT SUN join previously announced MY DYING BRIDE and PIG DESTROYER at Damnation Festival, which will take place at Leeds University Union on Saturday, November 3, 2012.